Update : Wow how insane has the last two weeks been. Cable has been in OR to address his leg and removal and bleeding and infection over and over and over and yes over again. He lost so much tissue and skin it was really hard to close and when it was it was hard to stop bleeding and had to go back into it. Stitches staples and repeat. Finally we have the infection we believe responding to the medication and the 5th time is the charm bleeding but the normal amount of leaking seeping and drainage!!! Thank you to the amazing three vets working to save this boys life..
We need your support we are way past this fundraiser on need and we are praying you will help. 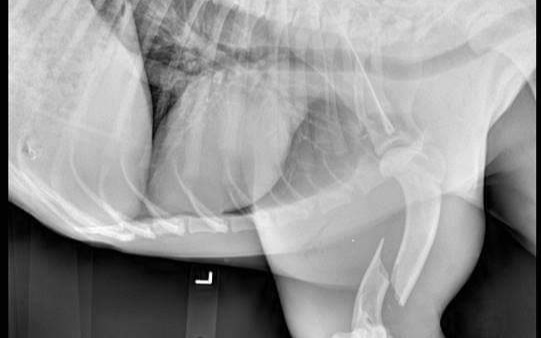 We must pay the vets office the bill and we need your help to do that please.. He will keep at his care and will go into foster when he is well enough.. Lets not give up on this boy now.. Is not all life worthy of our all.. This sweet boy was picked up from a colon of a shot dog. When animal control arrived there he was shot in the face cheek chest and leg. In excruciating pain and extremely thin this boy's still didn't so much as offer a growl. His leg as the X-ray will show nice to have surgery immediately it's already been 48 + hours or longer he needs immediate Care. 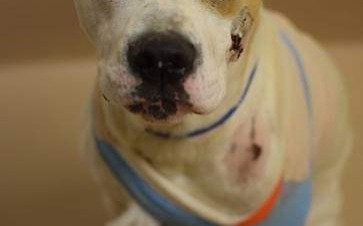 The ER Hospital where he was originally taken and our vet both conclude that he needs surgery surgery is estimated to be 1200 the cheapest to nearly 3,000. We would like to do all we can to save his leg if at all possible no guarantees but he is a large dog and with it being a front leg the vet feels like that is what we should try to do. He is an unaltered underweight by at least 20 lb male. We are pleading for help.